Proper posture is key to the health of your spine and can even make you appear more attractive and successful, but staying upright without slouching is hard work. For those who can’t seem to make standing and sitting up straight a habit, UpRight is an odd but effective gadget that can help you preserve the health of your back and shoulders. 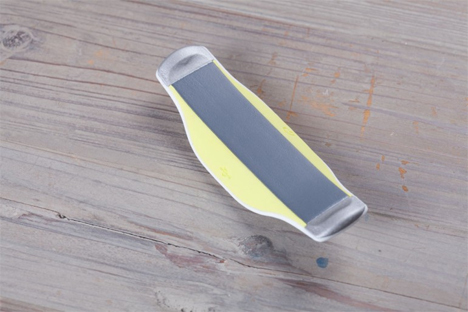 The small plastic device attaches to your back with an adhesive strip. When you put it on for the first time, you calibrate it for your ideal posture. An accelerometer and strain sensor can tell when you begin to deviate from that position and the UpRight will give a little vibration to alert you. Embedded Bluetooth technology syncs the device with a companion smartphone app. The app lets you formulate your own back health training programs to improve your posture as well as the overall health of your back. The company says that your posture can be improved in a few weeks. The UpRight comes with 60 adhesive strips, each of which is good for one to two days. It fits discreetly under your clothing and doesn’t interfere with movement (other than improving your posture, of course). The project is raising funds on IndieGoGo for the launch of the UpRight, and the first supporters can get their own for a $59 pledge. See more in Medical Marvels or under Science. May, 2014.